I've been making lots of photo albums to keep memories in recently so following on from last week's photobook from Saal Digital, I decided to finally fill in a birthday present. After receiving a 21st album for my birthday in June, it was about time a sat down and went through all my birthday pictures from my 21st celebrations. I've come across Freeprints a few times but haven't actually used the product. I finally did and it was defintely the right decision! I went through all my photographs and saved all the ones I wanted to print to my phone. Once I had all the pictures to my phone, it was incredibly easy to use. I simply downloaded the app, opened it up and selected all the pictures I wanted to print. From there they give the option to go through each individual photo to change the print format and final crop or you can use the automatically applied selections. 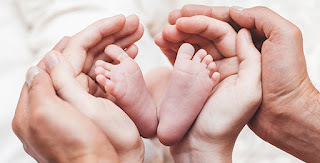 While I selected the photos from my phone, you can also select them from Facebook, Instagram, Dropbox, Flickr, Google Photos and more too, your accounts just need to be linked. Your free photo prints are printed exclusively on Kodak or Fuji paper and are delivered to your doorstep in just days. I'm really impressed with the quality of finish for the photographs that are now in my birthday album. It's not the best but I didn't need, nor want it to be incredibly thick photo paper. It's high detail, glossy and the perfect thickness for a photo album. On top of that, it is an extremely quick app to use and with super fast delivery. If you need your photos in 5 days or less, this is the way to go! The best thing about the app is that it is free to print the first 45 6x4 prints per month. You can only print one of each photo, but honestly you can just save it to your phone multiple times to get around that. That gives you over 500 free prints per year! Crazy. 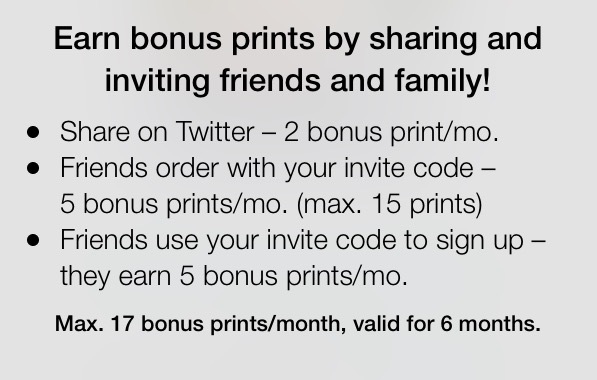 On top of that, you can also earn extra free prints by using the invite code hslack18 and then sharing your code with family and friends. This number is capped but in total it adds up to so many extra free prints a year which is more that ample! 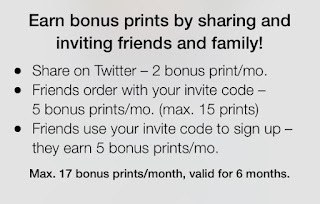 My referral code is hslack18 and will get you 5 more prints as a bonus. You can of course pay for extra prints which occur an additional charge as do prints in different sizes but the best thing about it, is that it is completely up to you! The other sizes you can get prints in are: 5x5, 7x5, 8x6, 10x8, 12x8, 15x10, 18x12, 36x24, 40x30. In other words, there is a massive variety. Of course, you can add as many as you like and the cost is relatively cheap in comparison to other services. With every order you pay a small delivery charge. It starts at £1.49 and can go up to, but never more than, £3.99. That applies to all orders, no matter how many prints you have. I had just over 100 and paid less than the maximum delivery charge. Since using the service, I get monthly reminders that I have the 45 print allowance available to use. While I don't particularly need any prints right now, I'm not unsubscribing (although you can do very transparently) because one day I might utilise them again. Click to download Freeprints on iTunes or Android and get your own freeprints. Again, if you want 5 extra free prints with your first order, use the invite code hslack18 on checkout to get the 5 extra prints. Do you like free things? Go download the app now! 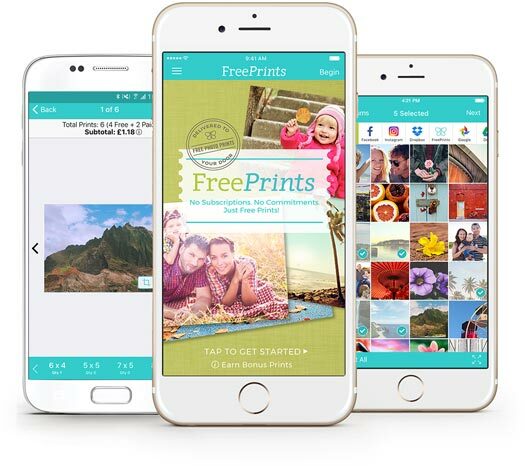 Freeprints is an amazing app to print photos! Ooo I'm going to have to try this!